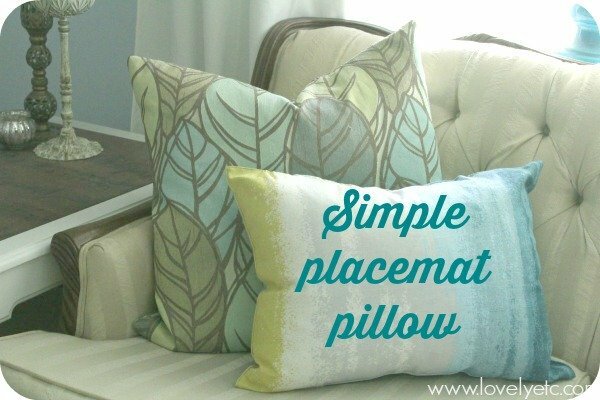 Sweet placemat pillow: cheap and easy - Lovely Etc. Ah, gotta love those projects that take less than an hour and cost less than five bucks. Particularly the ones that turn out super cute. And this, my friends, was just such a project. I have been crushing on Target’s new Threshold line ever since it came out a few months ago. And finally I found the perfect way to incorporate it into my house. I LOVE these new placemats – but I am just not a placemat kind of girl. Beautiful as they are, we just don’t do that whole fancy setting the table thing at our house. (Confession: to be quite honest, we don’t even eat at the table most of the time. My husband works late so I usually just eat on the couch after I put the little guy to bed). So, I have no need for placemats. But I am on the lookout for some new pillows for the master bedroom makeover I’ve got going on. This was my first time making placemat pillows but it will not be my last. Seriously, I didn’t realize how stinking easy it was. These particular placemats are made of two layers of fabric which is key. Seriously. Use a seam ripper (or scissors if you don’t have one) to rip open the seam along one side of the placemat. Stuff in a pillow form. Sew the two sides back together. Now the first placemat cost $3.50. (The other was on clearance for $2.75!) And the feather pillow insert was $1. Which means this project cost less than $5 per pillow! Now you may be wondering where in the world I got a feather pillow insert for $1. (Because we all know feather pillows are the best.) Whenever I find myself at the Goodwill, I check out the pillow bin. I completely ignore how the pillows look. They could be terribly hideous for all I care. I just look for down pillows with a removable pillow cover. Then I toss the cover (or redonate it) and use the insert to make my own pillows. Now I realize some of you may be totally creeped out by the thought of buying a used pillow. But it doesn’t bother me at all. I am throwing away the pillow cover anyway and all the pillows sold have been sanitized (that’s the law). BUT, if you are still grossed out by the thought, you can also do the same thing with the uglier pillows at stores like Ross, TJMaxx, or HomeGoods. I personally have had the best luck with this at Ross – if you are lucky, you can sometimes find down pillows with removable covers for around $5. But you may be wondering how this particular pillow worked out considering my placemat and my pillow insert were not the same size or even shape. Well, I made sure the pillow insert was the same width as my placemat and just stuffed it in there. The pillow is extra poofy with all of that extra stuffing but I kind of like that. I really hate a flat, droopy pillow. The second placemat pillow is still currently in the works. One of these is definitely going to end up in the master bedroom but I’m still debating which one. Anyone else loving the Threshold line at Target? Have you made a placemat pillow? And are you completely grossed out because I buy used pillows? You can be honest, I can take it. Great idea and I buy lots of things from thrift shops with no problems. You’ve convinced me to go on the lookout for some great placemats. Thanks! Such a great idea and they’re so cute. Much better than buying them. Thanks for sharing. Carrie: I am so glad you posted your placemat pillows!!! Just after Christmas 2013, I was shopping a Dollar General for post season markdowns and I came across the most beautiful placemats. I, like you, have no need for placemats, but they were a tapestry material and the print was remarkable. I pick them up thinking, “What am I going to do with placemats?” Then the light bulb of inspiration. . .pillows. Ever since, I have been collecting placemats to make pillows. They are great. And super easy!!! Thanks for the tip on buying used pillows. Much cheaper than buying bags of filling. God bless you and your family. Tanner, Aren’t placemat pillows the best! I definitely need to make some more. And I’m glad the used pillow tip was useful – I was a little afraid people were going to think I was crazy with that one!